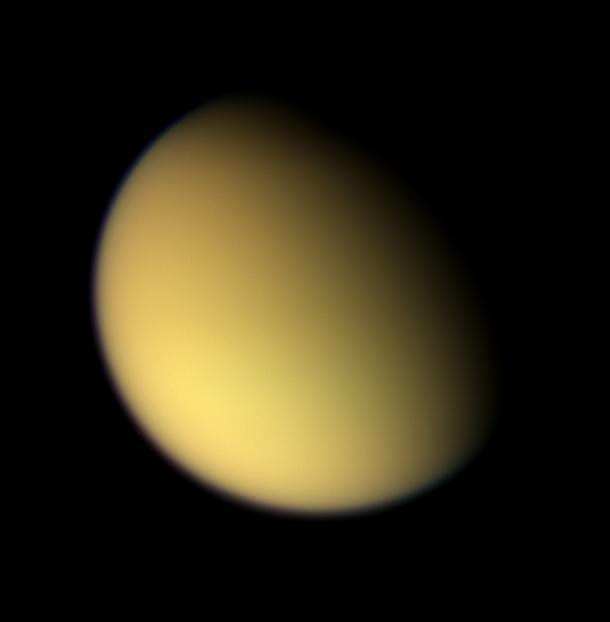 As Cassini approached Titan on Aug. 21, 2005, it captured this natural color view of the moon's orange, global smog. Titan's hazy atmosphere was frustrating to NASA Voyager scientists during the first tantalizing Titan flybys 25 years ago, but now Titan's surface is being revealed by Cassini with startling clarity (see PIA06222 ). Images taken with the wide-angle camera using red, green and blue spectral filters were combined to create this color view. The images were acquired at a distance of approximately 213,000 kilometers (132,000 miles) from Titan and at a Sun-Titan-spacecraft, or phase, angle of 55 degrees. Resolution in the image is about 13 kilometers (8 miles) per pixel.